Peaches Foster. That's right, banana can take a back seat. I purchased some peaches at the Farmer's Market that needed to be eaten right away. And I was craving caramel. 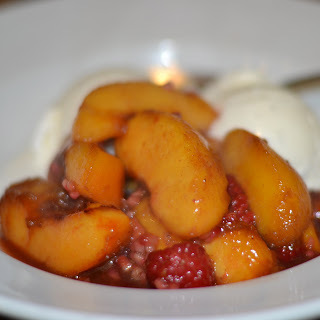 Plus I had a couple of pints of raspberries and I love them with peaches anyway. So, this is what I came up with. Heat butter in large pan over medium heat. Allow butter to melt until you start to see brown flecks. Add the honey and salt, and whisk until the mixture is combined well, a few minutes at most. Add the rum and light away pyro. Or, you could take the boring route and allow the mixture to come to a boil and reduce. It will take about 5-6 minutes to get the alcohol out, maybe more. Anyways, once the fire is out, add the raspberries and fold gently. Serve over vanilla bean ice cream. Did I already say it's damn good? Because it is.